Wishing you all a very Happy and Prosperous Vishu!!! We had planned for an elaborate write-up about Vishu, Kerala Sadya and to post all the Sadya dishes before Vishu but somehow it did not happen. So we are sharing with you all the sadya dishes that we have prepared and posted(except kadumanga achar) until now. Please click on each picture for it’s recipe. 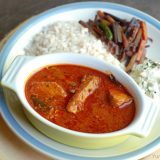 We have posted many different kinds of thoran in our space but in our household we usually prepare cabbage thoran or green jackfruit thoran for sadya. Many dishes like Vishu kanji, sharkkarapuratti, upperi, injithayir, beetroot kichadi, ada pradhaman, pal payasam, sambharam, rasam etc etc are also missing but hopefully we will able to complete posting all these dishes before onam or by next Vishu :). Sadya Recipes – Happy Onam! 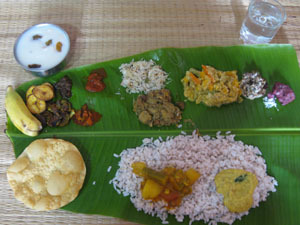 Omg, wat a droolworthy spread, real feast for eyes..Happy Vishu dear..
Oh my God. I wish, I could come over to eat that fully. I just love it. I am feeling hungry. wow… what a fantastic presentation.. real feast for eyes..
in one word- WOW..and I just love the first pic..reminds me so much of home..I could cry! Happy Vishu maaya n lakshmi… wooow ,,vazha ila saapadu super …cute lord krishna photo.. Happy Vishu to you and your entire family:) Wow…thats a wonderful spread there, wish I lived somewhere close to your house, just kidding. I like all entries you prepared for the occasion, splendid. Wow….what a spread! Everything looks wonderful! Happy Vishu to you both and ur families…Wow what a delicious and festive spread. Awesome traditional presentation.Love it..Also thanks a lot for sharing awards with me..that is so sweet of you guys and you guys deserve all those awards…CONGRATULATIONS. OMG! super dishes spread..So when are going to call me??? Happy vishu to you and your family..
Wow, that is one great platter. I wish I was eating that right now. Happy Vishu to you too. wow..nice presentation! vishu kaniyum ugran…happy vishu to both of u! Happy Vishu. That’s a lovely platter. I could figure out what the dishes are from the lovely pictures. Wishing you and your families a Happy Vishu.. The keralasadhya is always superb.Hope u guys had enjoyed the vishukani and the feast..
vow wonderful.god has blessed u with good kaipunyam,and ur hubbies r so lucky. wow,all those dishes sound inviting. Happy vishu ladies, thats a lot of variety, nice display !! 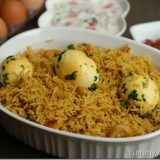 wow…thats cool…amazing post so many beautiful n mouthwatering dish!lov the spread yar…sorry for delay..was not feeling pass few days…so my vishu celebrations went to simple this yr! Happy Vishu!! Loved the simple Kani and what an awesome spread! Vishu kani nannayittundu..Sadya kandittu kothiyakunnu..Fabulous pics..